Bad weather can be a nemesis to your productivity, keeping your vehicles and equipment parked in the lot. Winter can be especially trying in the colder states with the snow and ice. Yet, even the West Coast has experienced strong storms that have closed roads and disrupted traffic. While not all conditions can be overcome, there are ways to keep your fleet on schedule using your telematics solution. Inclement weather can produce a range of problems: from a nuisance like rain, to full-fledge obstacles like mudslides or downed trees. Regardless of the conditions, deliveries need to be made and services must be completed. Many weather incidents produce disruptions to customers’ utilities and other inconveniences, and businesses typically see a spike in service requests as a result of these stormy conditions. Your telematics solution should be able to adapt and provide valuable information to keep your team on the road, safely completing their rounds. Here are a few of the features you can apply to your operations. Communicate More: Deploy better in-cab communication with your team. If you use Garmin devices, FleetOutlook™ is one of only two applications which can integrate with them. This integration offers two-way messaging, job status updates, bulk address distribution, work order integration, and turn-by-turn directions to the next job. If your organization doesn’t have Garmins, CalAmp’s MobileNav can provide a similar functionality. Reduce Idling: Idle time can have a significant impact to your bottom line/operating costs through wasted fuel and wasted time. Knowing where and when your drivers are idling their vehicles enables you to take preventative action to reduce the waste and increase overall productivity. With better mapping, you can reduce vehicle idle time by avoiding long lines of traffic and burning unnecessary gas. Use your idling data to train staff on how to better manage their vehicles, i.e. in what conditions should they turn their vehicle or equipment engine off. 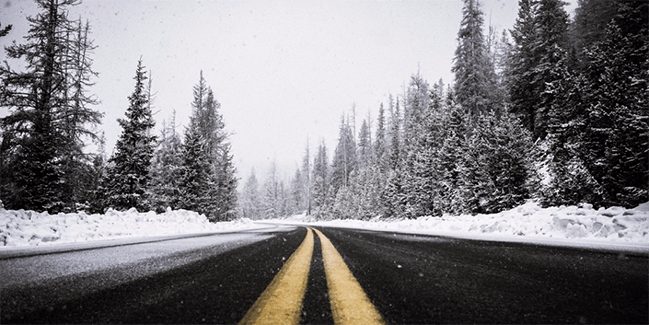 Drive Safer: Use alerts for hard breaking and sharp corners to notify you of possible unknown hazardous conditions. Monitor fleet speeds and provide guidance on appropriate driving for the conditions at hand. Use long stop alerts to identify potential problems and make a quick text or call to find out the issue and readjust scheduling as necessary. Drive Longer: Winter driving is especially hard on cars and any vehicle not made for off-road driving. Potholes seem to form under tires while mud and snow can knock alignments off. When it’s cold or rainy, vehicle and equipment engines might run longer. Your telematics system should track maintenance by calendar days, elapsed mileage and engine hours. If your fleet is having to re-route, more miles might be driven and trigger an oil change or tune-up sooner. Lastly, you can access the diagnostic trouble codes to notify you and your drivers of potential engine issues. There are many uses for vehicle telematics. Solutions can range from the simple, locate the carto complex, where has my vehicle been today? It really comes down to the ingenuity of the users and solution providers. So like the post office couriers, you and your team are ready to brave the elements and complete your appointments. If you would like more information on using vehicle telematics, visit our FleetOutlook page here.